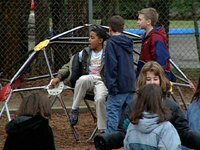 ANN ARBOR, MIApril 3, 2006 –A rigorous new study finds that children who have surgery to remove theirtonsils are very likely to behave and sleep better one year later. Infact, about half of the children in the study who were found to have Attention-Deficit/HyperactivityDisorder before tonsil surgery no longer met criteria for this diagnosis oneyear later. Other cognitive and behavioral issues also improved. On the whole, the 78 children who hadtheir tonsils out were much more likely than a comparison group of 27 childrento have had behavior and sleep problems at the start of the study. But by theend of the study, tests showed little difference between the two groups. The research paper is published onlinein the April issue of the journal Pediatricsby a team from the Universityof Michigan Health System. Data were collected from rigorous tests of sleepand breathing at night, and attention and behavior during the day. The resultssupport previous observations of a link between children’s sleep-relatedbreathing problems — such as snoring and breathing interruptions called apneas— and daytime behavior problems. The researchers caution that theirresults do not yet prove cause and effect, and that tonsillectomyis not usually a “cure” for ADHD. But, they say, the growing body ofevidence on this issue suggests that a significant number of children withinattention, hyperactivity, or sleepiness during the day – and alsosleep-breathing problems at night – may benefit during both the night and dayby tonsillectomy, an operation that was once performed on more than a millionchildren a year but has become much less common in recent decades. The procedure, also calledadenotonsillectomy when both the tonsils and structures called adenoids areremoved, is now performed on a few hundred thousand children a year. Nearly halfof them have the surgery because enlarged tonsils and adenoids block the flow ofair through their throat and impair their ability to breathe, and most of therest because of repeated ear and throat infections. Almost all of the childrenwho had surgery in the new study were thought by their surgeons to have symptomsof sleep apnea. One of the most striking findings – that children once diagnosed with ADHD nolonger had the condition a year after tonsillectomy – occurred in 11 of 22children with ADHD. This means that sleep and breathing problems are only partof the ADHD puzzle, and that tonsillectomy isn’t a cure-all for ADHD, notesChervin, an associate professor of neurology at the U-MMedical School. A few children even developed new ADHDa year after surgery. Chervin says this supports previous evidence that damagefrom sleep-disordered breathing may occur in early years, even though the resultis not seen until later. If confirmed, this would mean that early diagnosis andtreatment of sleep-disordered breathing are particularly important. When they entered the study, and beforeany surgery, all the children in the study had their behavior assessed by achild psychiatrist, as well as by their parents, who completed standardizedquestionnaires. The children had their attention span and short-term memorymeasured using a standard computer-based test, and spent a night in the U-MMichael S. Aldrich Sleep Disorders Laboratory. There, they were monitored forbreathing problems during sleep, and also for their level of sleepiness, asmeasured by how long it took them to fall asleep in a series of naps. All the tests were repeated a yearafter the children had a tonsillectomy at U-M C.S. Mott Children’s Hospital orSt. Joseph Mercy Health System, performed by otolaryngologists (ear, nose andthroat doctors) from any of eight practices in the local area. For thecomparison group, who had non-tonsil surgery or no surgery, the second round oftesting was performed a year after initial tests. The researchers analyzed thetest results using sophisticated statistical analysis. Among those children scheduled fortonsillectomy, the sleep-breathing tests showed that before surgery, half ofthem had obstructive sleep apnea (OSA), usually in the mild to moderate range,in contrast to only one of the comparison children. At the end of the study,only 12 percent of the tonsillectomy patients had OSA, including one patient whohadn’t had it before tonsillectomy, compared with 3 children among thecomparison patients who completed the sleep test series. In all, five childrendid not complete follow-up tests. Inpeople of any age, OSA occurs when breathing stops and starts repeatedly duringthe night, often in part because the throat is narrowed or blocked, keepingsufficient air from getting into the windpipe and lungs. People with sleep apneaoften snore, or snort and gasp throughout the night, though not all snorers havesleep apnea. About one to three percent of children have OSA, including a goodnumber of those children who snore regularly. Enlarged tonsils are a commoncause of the sleep disorder in children, while obesity, allergies, acid refluxand structural abnormalities in the head and neck also contribute to it inchildren and adults. Interruptions in breathing during sleepcan cause the brain to “wake up” to some extent, even if the sleeping personis not aware of it. These repeated interruptions disturb the sleep patterns thatare essential to a good night’s sleep – and are thought to be the reason whydaytime behavior might be affected by poor breathing during the night. Sleepapnea is also linked to heart and blood pressure problems, and in children, toslow growth. The researchers also compared thetonsillectomy patients who had had OSA before surgery with those who had not. Inall, the children who had not had it before tonsillectomy were just as likely asthe children with OSA to have a high score on standard tests of hyperactivity,and just as likely to have behavioral improvement after tonsillectomy. As a result of this finding and otherdata, the study adds to an issue that’s currently puzzling sleep researchers:Why the results of sleep tests to monitor brain activity and breathing don’talways correlate with children’s daytime behavior. The standard measures usedto assess children’s sleep problems, and the threshold levels that are used toassess the severity of a sleep problem, may need to be reevaluated, says Chervin. To explore this issue further, he and his U-M colleagues are now recruitingpatients for a study that will compare those standard measures with new ones,including a measure of how hard children work to breathe during the night, andanother that looks for subtle changes in brain activity with every laboredbreathing cycle. The bottom line for parents, Chervinand his colleagues say, is that any child who snores regularly, or has othersigns of breathing problems during sleep, may benefit from an evaluation forsleep problems and perhaps from tonsillectomy – especially if the child isalso having behavior problems at home or school. In addition to Chervin, the study’sauthors are Deborah Ruzicka, R.N., Ph.D., of the Sleep Disorders Center; BrunoGiordani, Ph.D., Elise Hodges, Ph.D., and James Dillon, M.D., of the U-MDepartment of Psychiatry; Robert Weatherly, M.D., formerly of the U-M Departmentof Otolaryngology and now at the University of Kansas; Carole Marcus, MBBCh, ofthe Sleep Center at the Children’s Hospital of Philadelphia; and Kenneth Guire,M.S., of the U-M School of Public Health. For more on the U-M Sleep DisordersCenter, visit www.med.umich.edu/neuro/sleeplab.The new study involving children scheduled for tonsillectomy is recruiting onlypatients whose surgery will be performed at C.S. Mott Children’s Hospital orSt. Joseph Mercy Ann Arbor hospital; more information on the study and contactinformation for prospective participants is available via the U-M Engageclinical research web site, www.med.umich.edu/engage,or by calling 800-742-2300 and entering 6512. The study was funded by the NationalInstitute of Child Health and Development, the National Heart Lung and BloodInstitute, the National Institute for Neurological Disorders and Stroke, and theU-M General Clinical Research Center. Thank you for your interest in thesleep, behavior and tonsillectomy study performed by U-M Sleep Disorders Centerresearchers. If your child has shown signs of breathing problems or loud snoringwhile he or she sleeps, or if you are wondering if your child might qualify forour study, here is some important information. First, tonsillectomy and adenoidectomyare often considered as a treatment for children who have breathing problemsduring the day or during sleep, and for children who experience frequent throatand ear infections. Tonsillectomy involves an operation under generalanesthesia, during which the tonsils and other nearby tissues in the throat areremoved. Please talk with your child's doctor orhealth care provider about whether tonsillectomy might be helpful. Suchoperations are usually performed by surgeons called otolaryngologists, or ear,nose and throat specialists. You may want to ask your child's doctor for areferral to a sleep specialist or an otolaryngologist. If you’d like to findout how your child might be evaluated by a U-M pediatric sleep specialist, orpediatric otolaryngologist, call the U-M Health System Physician Referral linetoll-free at 800-211-8181. We thank you for your interest in ourresearch, and if you have questions or concerns about your child, we encourageyou to bring them up with your pediatrician.